Scooper - Technology News: Brexit: what’s at stake for the UK as it triggers Article 50? Brexit: what’s at stake for the UK as it triggers Article 50? Nine months after a small majority of the British people voted to leave the EU, the UK Government is triggering Article 50 of the Lisbon Treaty - the official process by which a country exits the union. Article 50 has never been invoked before, so it’s untested. It provides only a loose framework for the exit process, not a step-by-step guide. So how will the two year negotiations go? What will the outcome be? How will the UK and the EU be affected by Brexit in the long term? There is no shortage of known unknowns and unknown unknowns . So in the midst of all those questions, here are four things we know are at stake as the UK’s EU membership comes to an end. 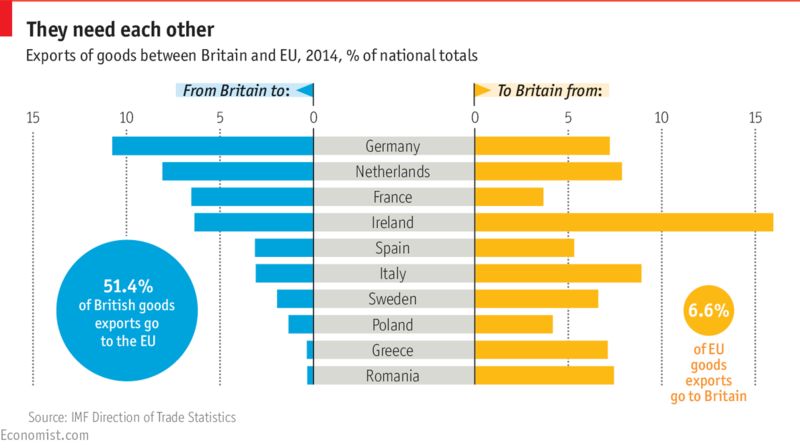 British trade with other EU countries has risen rapidly since it joined the union in 1973. The EU now receives over 51% of British export goods. The importance of this trading relationship isn’t likely to change after Brexit becomes official. Calculating the effect of Brexit is impossible until the terms of the post-Brexit deal are known. But the relationship is two-way and important for other EU members as well as the UK. It is often claimed that UK is the EU’s largest single export market for goods. That’s just about the case if you treat the UK as if it were not in the EU and focus on EU goods exports to non-EU countries. 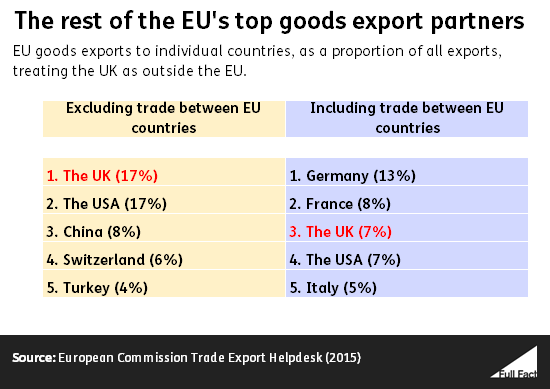 The UK is very slightly ahead of the USA, with 16.9% of EU exports going to the UK, compared to 16.5% going to the USA in 2015 . Counting EU countries, Germany receives the largest amount of goods exports from other EU countries. The UK is a major recipient of inward Foreign Direct Investment (FDI) and also an important investor in overseas economies. The UK had the third highest stock of inward FDI in the world in 2014, behind the US and China. In 2014, EU countries accounted for just under half the stock of FDI in the UK (£496 billion out of a total of £1,034 billion - 48%). This compares with 24% from the US and 28% from other countries. The share accounted for by the EU has fluctuated between 47% and 53% over the last decade. Britain accounts for nearly a quarter of the EU’s financial services industry, and about 8% of national income is generated by banks, brokerages, investment firms and other financial companies, many of which are not British. Around half the world’s largest financial firms have their European base in Britain. While it’s still not clear what impact Britain’s EU departure will have on the country’s finance sector, many industry chiefs have spoken openly of their post-Brexit plans to relocate staff abroad. “We have flexibility to decide where to go but we will definitely have to move,” Andrea Orcel of Swiss bank UBS told participants in Davos this year. A recent analysis from Bruegel , a European think tank, estimated that as many as 30,000 finance sector jobs could be lost in the aftermath of Brexit. The think tank predicts that many of those jobs could end up going to Frankfurt, with some moving to Paris, Amsterdam and Dublin. Britain's total contribution to the EU budget for 2016 was set at 19.4 billion euros (£16 billion), including rebate and customs duties. It receives about 7 billion euros, mainly in agricultural and regional subsidies, leaving a gap to fill which is the equivalent of just over 5% of the total EU budget. Germany, the EU's largest member, will inevitably have to provide the most extra cash when Britain's payments cease. Germany's Ifo Institute, one of the leading European economic research centres, estimates the country's additional payment will be 2.5 billion euros.